Last Friday night was Family Fun Night at our elementary school. I want to remember that it was a magical night. We lost all our kids at one point or another. The music was blaring so loud we couldn't hear each other talking. Lucy's diaper was super soggy all night (I forgot to bring extras) and she got stuck in one of those giant jumpy things while Dave and I were talking to the principal. They had to announce over the loud speaker for her neglectful parents to come get their screaming child (they didn't really say the neglectful part out loud but I could hear it in the tone). The sun being at the perfect slant that it created halos around Grace and Claire's hair as it whipped up around them as they rode their bikes in front of me. 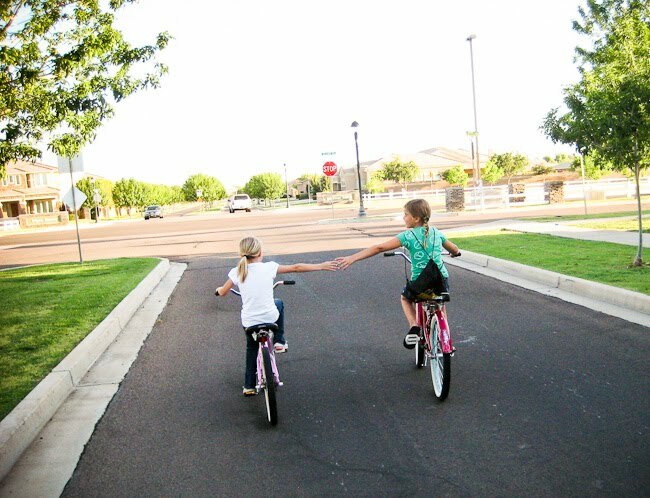 The way Claire's bike went clickety-clack in front of mine and how I hadn't realized before that she can stand up while pedaling and play the "kick-the-garbage-cans-on-the-way-down-the-street-as-you-ride" game with Grace. I loved observing Elle's giant smile and the way she interacted with her friends. And Grace's drenched but triumphant smile after getting dunked in the dunking booth...as well as the jubilant expression shining from her face while basking in the attention from Elle's friends when they all encircled her in awe that she actually got dunked. Lucy's proud smile after she finally successfully maneuvered her way through a big, blow-up obstacle thing (the time when Dave and I were responsibly watching). Dave's sun-kissed face coming through the crowd wearing his crisp white shirt and a smile (he was a little late coming from work). The wind whipping through our hair as we rode our bikes home. The pure joy that comes with having a new pet...even if it's just a goldfish (more on that later). Yes, it was a magical night. The only thing that would have made it better is if Max would have been there...but he got to go to a movie with friends after football practice so I'm sure his night was just as magical in it's own way. I realized I need to make more nights magical like that. And that I can change how flustered I get about all the "to-dos" swirling around in my head. Just a little change of attitude from me makes all the difference. beautiful. simple memories. motherhood. thanks for sharing! Love it! My in-laws just left this morning headed back to AZ. They will be thankful for the warmth and sunshine after our Colorado cold. I love how you see the good in a night like that! Thanks for sharing the importance of a mother's attitude. So good Shawni! i love when i can just sloooow down and notice the beautiful things because my to-do list is always very, very long! LOVE those pictures...and nights like that. Why is no-one wearing a bike helmet? I'm not sure what the legal issues around helmets are for you,(In Australia Helmets are a legislative requirement and I guess that colours my perception,) but truly, accidents can happen and acquired brain injury makes a family's life very complicated. You have beautiful children, please keep their heads safe! There are lots of cool options in protective gear, and a helmet can always be bling-d up a little if that's what it takes to get it worn. In our family bike helmets are to be worn every time you are on your bike. If you are wearing your head, it needs a helmet on it. Please think about it. 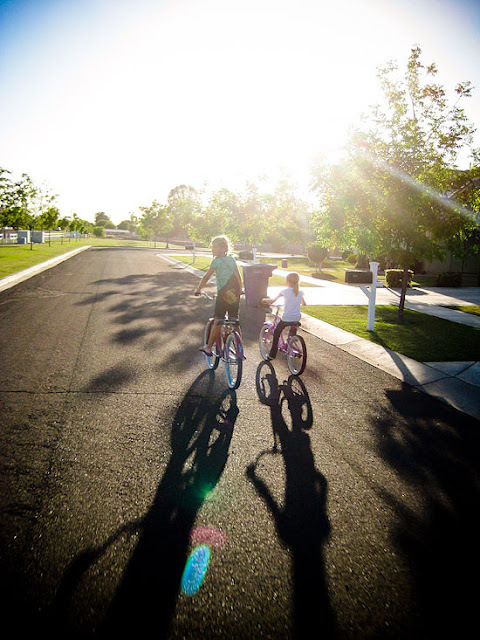 There are so many dangers it is difficult to protect our children from, but bike helmets and car seat belts are pretty straight forward, and could make such a difference. Thank you for sharing your life so openly, and for inspiring me to be a better mother. Thank you for sharing how a simple family night can be magical :) My fourth child has a concert at school tonight and to be honest with you, I wasn't looking forward to going. With five kids, there are always so many things to do (as you know!). But after reading your post, I realize I need to slow down and take the time to be thankful that my son is in the choir (he doesn't enjoy singing or performing and yet somehow ended up joining choir :) and enjoy these small moments. Thank you! I love how you relate the potentially annoying moments (like becoming a human collect-all) but also the good ones. I have to relearn this lesson all the time, that mothering and family times aren't going to ever be pure, unadulterated joy. It's always a mix. But when I expect that, I can loosen up and enjoy the craziness! i love this shawn. it reminds me a little of how similar we are in some ways. you are really great. i miss you guys.